Top 10 Best Homebrew Gift Ideas for this Holiday Season! Tis the season for Homebrewing! It is not always easy to find that perfect Holiday gift for your boss, Father In Law, Dad, Boyfriend, Girlfriend or Beer Lover in your life. So with the Holiday Season quickly approaching, we thought this was the perfect time for our Top 10 Best Home Brewer Holiday Gift Ideas! This year we tried to select a variety of the very best home brewer holiday gifts that accommodate a wide range of home brewing budgets as well as home brewing gift ideas for every beer brewing experience level from advanced home brewers to someone who loves beer and is looking to try their hand at home beer brewing for the first time. So with out further ado, here is the HomeBrewingDeal.com Top 10 List for Best Home Brewing Gifts Ideas of 2017! This is a Holiday gift for beer lovers of all kinds! It is sure to please anyone who is curious about the craft and tradition of beer brewing! There are tons of home brewing kits out there, but we selected More Beer’s Deluxe home beer making kit because it comes with everything needed to brew a batch of beer at home! Unlike most home brewing kits, this one even comes with a stainless steel 5 gallon brewing kettle and a 5 gallon American Pale Ale beer recipe and ingredient kit. It is also an incredible value! The kit costs just $129 and even ships for free. 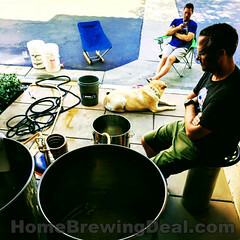 Click here for all of the details or to purchase this home beer brewing starter kit. This is the perfect Holiday Gift Idea for home brewers of any experience level! The Ss BrewTech BrewMaster Brew Bucket 7 Gallon Home Brewing Fermenter is the best deal out there for a stainless steel home brewing fermenter. Not only are they beautiful, they are function too. This 7 gallon stainless steel fermenter is great for both extract home brewers or all grain brewers. In fact I like them so much that I personally own two of them! Better yet, these Brew Master edition fermenters are currently on sale for $229 and they ship free! Click here for more detail or to purchase one of these stainless steel home brewing fermenters. 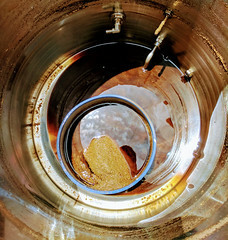 Clocking as the 8th best gift idea for home beer brewers is John Palmer’s, How to Brew! How to Brew is the closest thing there is to a home beer brewing bible. It is packed with helpful information and covers all of the fundamentals of how to brew beer at home. I would recommend this book for any new to intermediate level home brewer! You can pick up a copy for $18 at More Beer. You can never go wrong giving a home brewer a high quality home brewing mash paddle and that is why it is our 7th Best Homebrewing Holiday Gift Idea! Mash paddles are one of the primary tools that a beer brewer uses and are used by beer brewers at every skill level. The are a variety of home brewing mash paddles to choose from. I have tried several and my favorite are hardwood maple mash paddles because of how well they hold up over time and gain character with every batch of beer that you brew. You can purchase a 5 star rated maple mash paddle here for $49. Ask any home beer brewer out there what the best beer recipe design software is and 9 out of 10 will tell you BeerSmith 2. That is the reason why it made it to the 6th spot on our best homebrew gift list. Beer Smith is a great gift for even the most advanced home brewers and an essential tool for beer brewers at any skill level. The integration of recipe formulation, preparing proper yeast starters, calculating out mash cycles, and setting up proper fermentation temperature control schedules is truly a work of art. Every home brewer should have this software and at just $24 it is also a great deal! Click here to purchase a copy of Beer Smith home brewing software. What is made from food grade stainless steel, converts wort to beer and made the top 5 best home brewing gifts of 2017 list? A More Beer Stainless Steel Conical Home Brewing Fermenter, that’s what. If you are not familiar with More Beer and the home brewing equipment that they make, you should be! Aside from making some of the very best home brewing systems available, they also make the best conical fermenters available to home brewers. One of the reasons that their products are so good is because they do not cut corners! Everything from the sanitary tri-clamp fittings to the ultimate rotating racking are are all rock solid. Quality comes at a price, but right now they are on sale and you can save nearly $300 on these stainless steel conical fermenter just in time for the holidays! Click here for all of the details on this home brewing gift idea! You know whats cool, I mean really cool! The Keg King Mark 4 Home Brewing Kegerator, which is also our pick for the 4th best home brewer gift idea. One of the reasons why this kegerator made it so high on our list is because it was designed specifically with home brewers in mind. In fact, not only is it a kegerator but it is a fully functional fermentation chamber! It is also an incredible deal for a stainless steel kegerator with a cooled stainless steel draft beer tower and InterTap stainless steel beer faucet included! Right now you can pick a Keg King Kegerator up for under $560 and best yet, it will ship to you for just $6.99! Click here for all of the details on the Keg King Mark 4 Home Brewing Kegerator! Our choice for the 3rd best home brewing gift for this holiday season is also one of the best home brewing deals and products of the year! The Brewer’s Edge Mash and Boil home brewery is one of the best inventions since beer! It is the most affordable electric home brewing system on the market and is loaded with awesome features like a removable stainless steel grain basket and digital temperature controller. You can even use the Mash and Boil to distill! The most amazing part is that it costs just $299. Most similar home brewing system costs 3 times that much and that is what makes the Brewer’s Edge our #3 Choice for the best Home Brewing gifts! Click here to purchase a Brewers Edge and get low cost flat rate shipping! The most important part of equipment that a home brewer has is his or her kettle! That is why a new home brewing kettle is the 2nd best gift most home brewers can get! As far as home brewing kettle go, Blichmann’s are arguably the very best available and are the kettles that I use in my home brewing system. Blichmann brew kettles are built by engineers that have a love for home beer brewing, but the features are what really set them apart. One of the best features in my opinion is the heavy-duty borosilicate glass level gauge. It never clouds or scratches and features rugged stainless steel guard with engraved volume graduations, cleaning brush and clean-out ports. Also unique to Blichmann Brew Kettles is the parabolic draw valve that provides linear flow! It is built with a 90 degree outlet that can be oriented at any angle to make hose routing simple and kink free. You can not go wrong with a Blichmann Kettle. The 7.5 Gallon version of the Blichmann G2 is available for $259, click here for more details or to purchase one! Drum roll please! The best home brewing gift idea for this Holiday Season goes to the Blichmann Electric All Grain Brewing System! Okay, let me start by saying this is not cheap. So unless you are either wealthy or the brewer you are getting this for saved your life on several occasions, this is probably not a very reasonable stocking stuffer! But it was way too awesome not to have on this years list! So, if you want a top of the line, electric, 3 vessel brewing system then look no further! 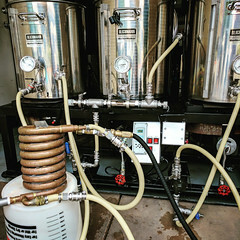 It comes in 4 different batch sizes and includes 3 Boilermaker electric kettles with 240 v BoilCoils, 2 Riptide Brewing Pumps, 2 Tower of Power Controllers, all on a large custom stainless steel table with the necessary hoses and fittings! Click here for more information on the number 1 gift ideas for this Holiday Season! For $69 The Ultimate Growler is not a bad backup choice either! It would have been the 11th entry on this years list of the Best Gift Ideas for Homebrewers! It is on sale right now and ships free as an added bonus! Check back often as we will be listing new home brewing gift ideas all November and December as well as information on home brewing holiday sales! Coupon Description: Enter promo code STOUT and check out and you will receive 15% off of stout home brewing beer kits at Love 2 Brew to celebrate Stout Beer Day. This limited time Love2Brew.com promo code is good for 2 days only, so act fast if you want to take advantage of the savings. Coupon Description: Love2Brew.com currently has a promo code that will save you $10 Off Your Order of $50 to celebrate Columbus Day! So now is your chance to save 20% on popular home brewing items at Love 2 Brew. 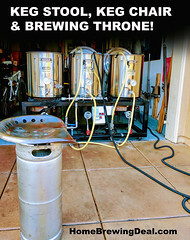 Just click the following home brewing link and make sure that you enter Love 2 Brew promo code LEIF at check out to take advantage of this limited time homebrew offer from Love2Brew.com. Coupon Description: Get a $25 Gift Certificate Free with a $150 Order at Love2Brew.com when you enter the above mentioned Love2Brew promo code at check out! This is a great chance to save big on some new home brewing hardware at Love 2 Brew!